Lew Wallace is widely renowned as the Hoosier author of Ben-Hur, the best-selling novel of the nineteenth century. What many people don’t know is that Lew’s wife, Susan Elston Wallace, was also a well-known writer in her day. Lew carried this photo of Susan with him in a locket during the Civil War, image courtesy of the General Lew Wallace Study digital collection. Born on December 25, 1830, Susan was the fourth of nine children born to Maria Aiken and Major Isaac Compton Elston. Major Elston was instrumental in creating a private school where his children could be educated. Susan was described as “petite and studious.” She often climbed to the top of a sturdy bookcase to read, and later retreated to the attic for privacy. Susan’s mother appreciated and encouraged Susan’s studious nature. In her teens, Susan was sent for either one or two years to a Quaker school in Poughkeepsie, New York, which was run by two sisters, the Misses Robinson. Lew and Susan met in 1849 at a party held in Crawfordsville by her sister. They courted for four years and were married in 1852. 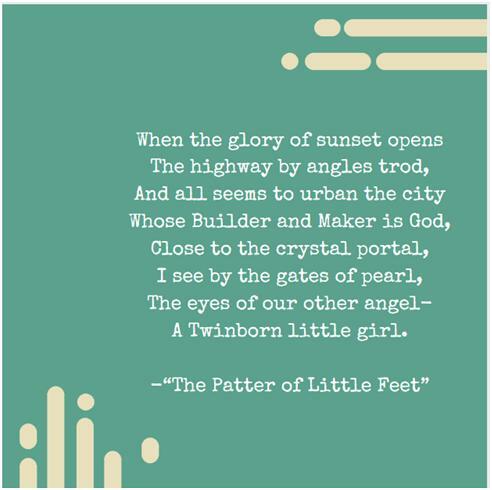 Harper & Brothers published Susan’s first poem, “The Patter of Little Feet,” in February 1858. 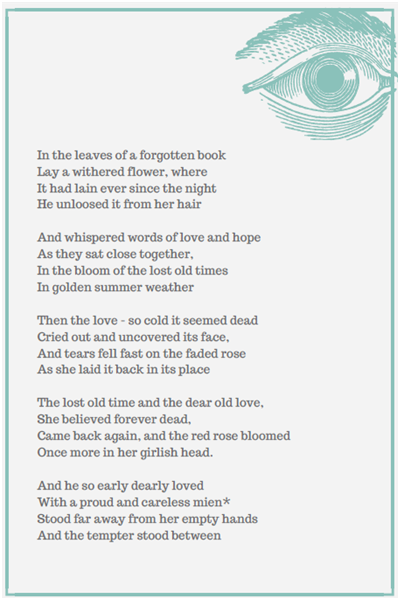 Over the years, the poem has raised a great deal of speculation. Susan and Lew had one child, Henry Lane Wallace. “The Patter of Little Feet” was such an evocative piece about a parent’s love for her son and loss of her daughter that many readers wondered if they had originally had twins. The poem goes on to describe the mother’s longing that she will someday reach heaven and hear the patter of her daughter’s feet on heaven’s floor. Not only readers but researchers have also been fascinated with the poem. One biography in our research files at the General Lew Wallace Study & Museum states that Susan had twins, but that the daughter died after two days. A paper written about Susan in the 1950s, possibly citing this biography, also makes the same assertion. Wallace scholars have found no cemetery records to support this. Additionally, one Wallace scholar discovered a letter in which Susan referred to the “Twinborn little girl” as a literary invention. Nevertheless, the pathos of her writing certainly complicated scholarly research. 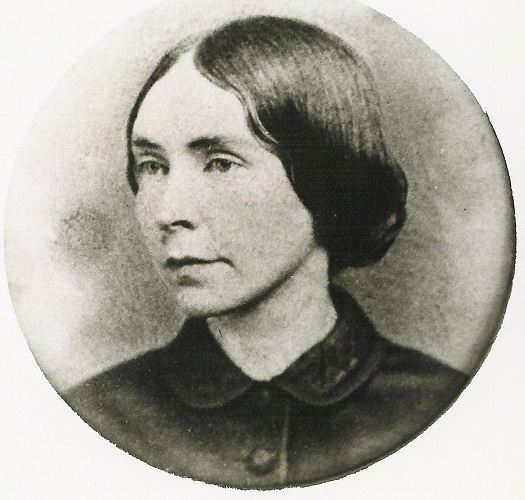 Before the Civil War, Susan’s writings consisted largely of sentimental musings about women and children, flowers, romance, and lives cut short. During and after the war, her writings took a more mature and incisive tone as she continued to write about women and their situation in life. 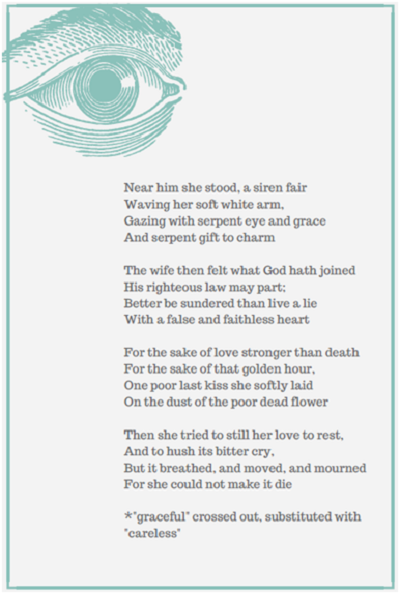 Interestingly, this poem does not seem to have raised any speculation regarding Lew’s faithfulness to Susan. 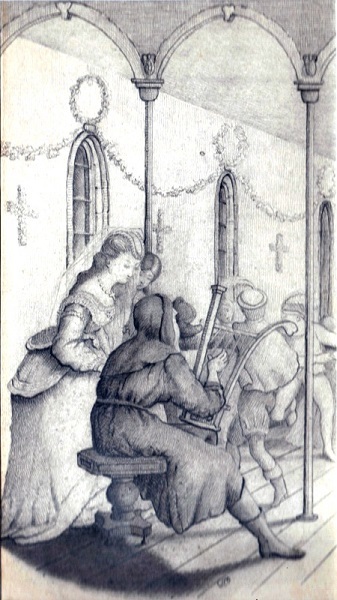 Lew’s sketch from Susan’s Christmas story Ginevra, image courtesy of the General Lew Wallace Study digital collection. Susan also wrote a great deal of nonfiction about her travels, which originally appeared in weekly and monthly publications. Later, they were collected in her books: The Storied Sea, Land of the Pueblos, Along the Bosphorus, The Repose in Egypt, and The City of the King. (Many of her books are available from Amazon in commemorative edition paperbacks published by the General Lew Wallace Study & Museum.) Her short book Ginevra: A Christmas Story is a gothic story about a young noblewoman and the man she loved. It was published with illustrations by Lew Wallace. Susan died in Crawfordsville on October 1, 1907, leaving behind an body of literary and nonfiction work overshadowed by that of her husband. Learn more about Susan’s life and work here. A version of this appeared in the Hamilton County Business Magazine – January 27, 2012. When doing historical research, it’s easy to find yourself investigating unexpected paths. The murder of Benjamin Fisher is one such case. While examining the War of 1812 and its presence in Hamilton County, I came across Fisher’s story in the local histories. The more I looked at the case, which is considered the first known murder in the county, I began to wonder about many of the tales about it that have been passed down through the years. The murder happened in Strawtown, which was a lively place at that time. It was the intersection of the Lafayette Trace – which ran from the Whitewater Valley to the Wabash River at Tippecanoe – and the trail that followed the White River from southern Indiana. The area was a convenient stopping point for travelers along the trails. A distillery and horse racing track were among the first businesses. At this point in time, Hamilton County had not been established and the area was still part of the Delaware New Purchase. 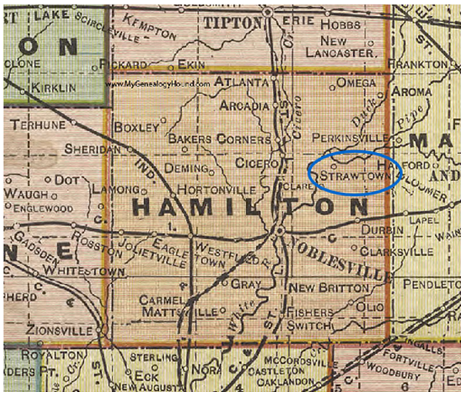 1908 Map of Hamilton County, Image Courtesy of My Genealogy Hound. I was unable to locate contemporary accounts of the murder – the earliest version available is from 1874, some 53 years after the incident. Fisher himself was born in 1791 in Pennsylvania and moved to Indiana after serving in War of 1812. He was an early settler of the Fishersburg area, which would be named for him, in Madison County. The standard version of the story begins in March of 1821 when Shintaffer got into an argument with one of the local Native Americans – supposedly about watering the liquor. Shintaffer knocked the Native American down and threw him into the fireplace, where he was severely burned and possibly died. The repercussions of the incident were felt in April, when Benjamin Fisher and other farmers traveled to Strawtown to get axes sharpened at Shintaffer’s (who had the only grindstone in the area). A group of American Indians, possibly Miami or Pottawatomie, came to revenge themselves on Shintaffer for his actions the month before. Armed with knives and tomahawks, they attacked the tavern. The farmers responded with axes and whatever was at hand. They held off the Native Americans until Shintaffer was wounded and Fisher brained by a tomahawk. One Native American was killed, at which point the group fled. Excerpt from The Good Old Times in McLean County, Illinois, Vol. 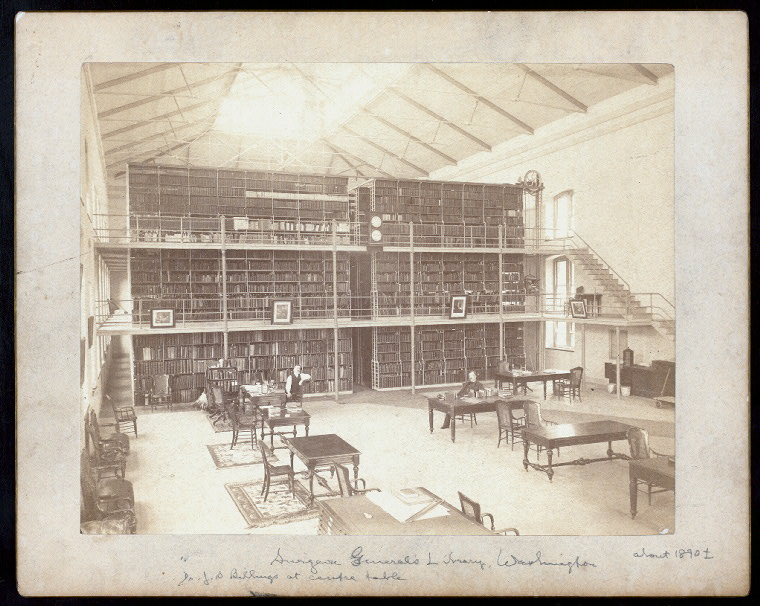 2, p. 638, image courtesy of Google Books. 1) Different versions vary regarding the number of parties involved, but it generally comes out as 4 to 6 farmers holding off 8 to 12 American Indian warriors. When one farmer was down and another wounded, the Indians abandoned the attack without completing what they came to do. This is pretty impressive hand-to-hand fighting skills on the part of the farmers and seems somewhat unlikely. 2) No guns were used – the Indians allegedly wanted silence, but nothing prevented one of the farmers from stepping into the trading post and picking up a firearm. 3) For unknown reasons, Fisher was buried in Strawtown, where he died – not sent home to his family and his own property, which was only about eight miles away. There was no official burial ground at that time in Strawtown and no reason why that site would have been preferred. The grave was apparently left unmarked. Later historians would mention a “low mound” with no headstone near what would become the Strawtown Cemetery. It could possibly be located with modern archeological techniques. 4) The night after the killing, Shintaffer packed all of his goods and his family into a canoe and left the area. He followed White River to Greene County and settled there for a few years. The histories there refer to him a man of “considerable notoriety” having a “quick temper” and often being the defendant in court cases. 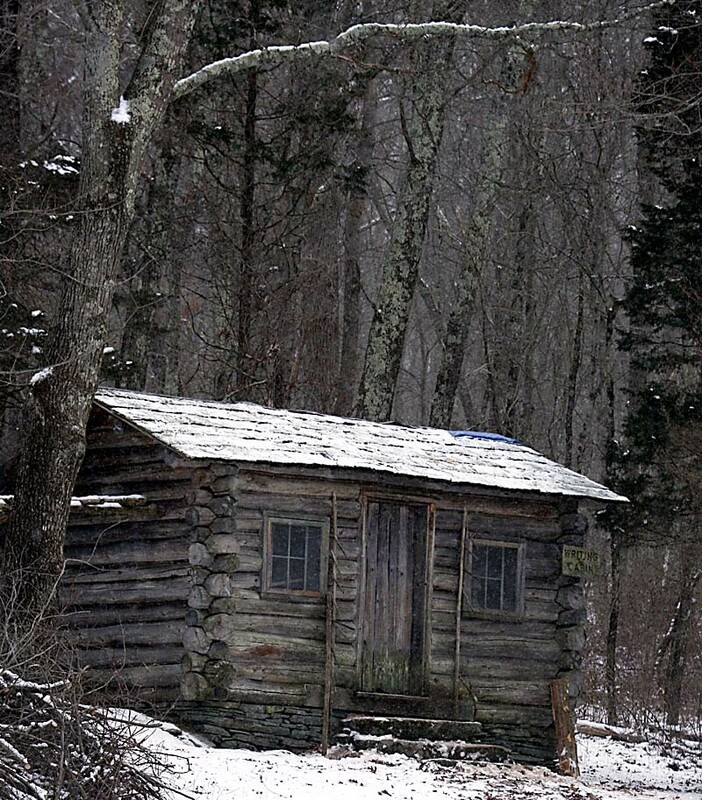 He left there in 1832 and finally settled in Cass County, Michigan. 5) Finally, despite this being a sizable attack on an isolated settlement, no record of an official reaction has been found. There was apparently no attempt to capture the perpetrators, even though during the War of 1812, soldiers would chase Native American warriors from Franklin County all the way to the area of modern Hamilton County. In 1824, three years after the Strawtown fight, Governor Ray would call out the militia because of the fears of retaliation for the Massacre on Fall Creek. But in this case – a wholesale assault and battle involving possibly 20 people and two deaths – nothing was said or done that appeared in any official documents. 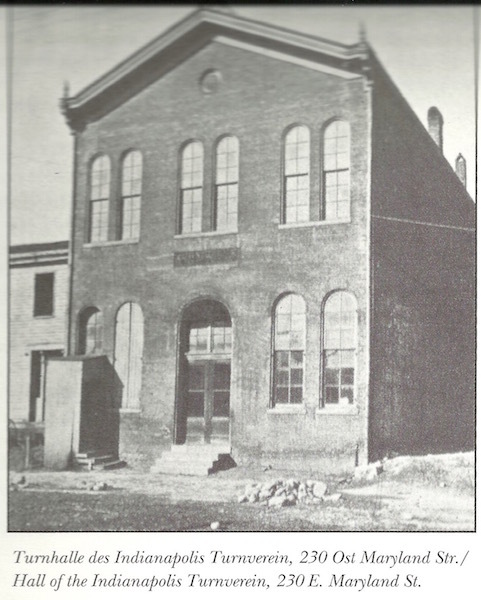 Image courtesy of Hoosier History Live. Some of the people who remained to tell the story were interesting characters. Shintaffer himself was probably the source of the account written down in 1874. One of the alleged participants was Jacob Hire, although he’s not named in the earliest versions. He has a shadowy background and was sometimes partner with Shintaffer in business. He was the person who built the distillery and horse racing track. Later, he became Overseer of the Poor for White River Township, (he had apparently built up a good client base). Another alleged participant was Jacob Colip, but he is also not mentioned in the earliest versions and there is no record of his being in Hamilton County until 1823. No other participants are named. In the final analysis, many of the stories don’t appear to hold up and it’s not clear what actually happened. 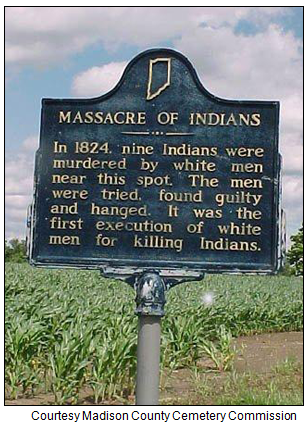 Native Americans have been accused of this crime for over 190 years, even though they gained nothing from it – not even revenge. 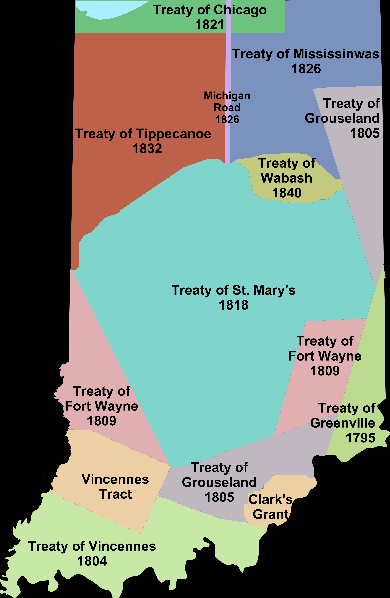 With the signing of the Treaty of St. Mary’s in 1818, the American Indians were already leaving the state, so the motives in all cases seem a little unclear. No other possibilities seem to have been considered – including the short-tempered, violent man who fled the area immediately after the killing. No matter what else may have happened, Benjamin Fisher was in the wrong place at the wrong time and left a conundrum for future historians. Clemens (Left) was the Vonnegut family patriarch and lifelong freethinker. 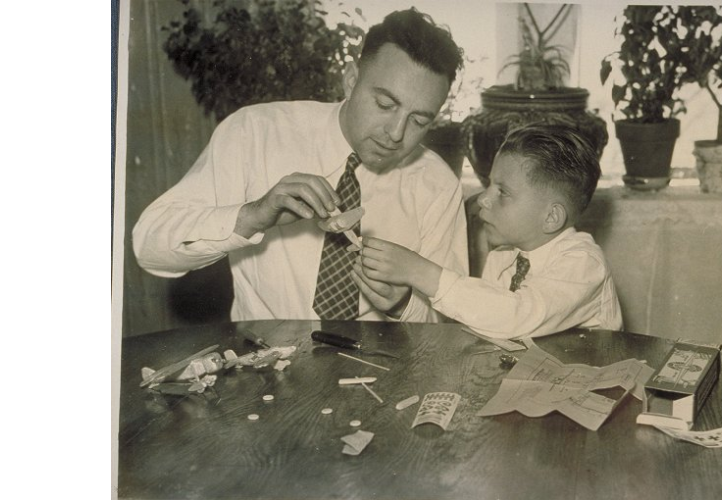 Kurt, Jr. (Right) was the great-grandson who carried his humanist heritage into his writing. Images courtesy of IUPUI University Library, Special Archives and Collections/citelighter.com. The Vonnegut Hardware Company on Washington Street, circa 1878. 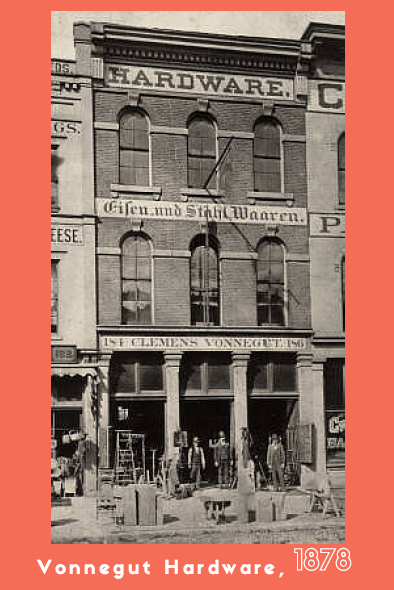 Founded by Clemens Vonnegut, the store would be an Indianapolis stable for well over a century. Courtesy of Indiana Historical Society. Clemens Vonnegut was born November 20, 1824, in Münster, Westphalia. In his early years, he studied in German public schools and apprenticed as a mercantile clerk. As recorded in the Indianapolis Press, a young Vonnegut came to the United States in the early 1830s, on assignment from his employer, J. L. de Ball and Company, which sold specialty fabrics. His year in New York convinced the young Vonnegut that America would be his permanent home. 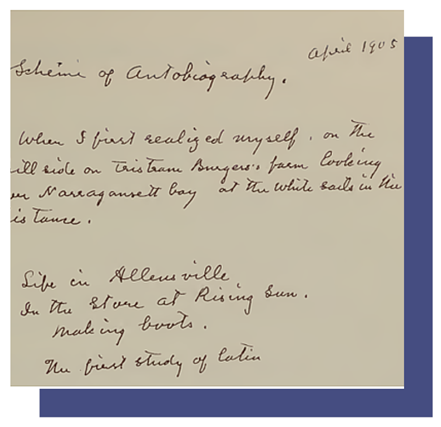 He then traveled to Indianapolis with his friend Charles Volmer to start a new life. The Socialer Turnverein, a social club co-founded by Vonnegut, was the home of the Freethinker Society of Indianapolis. Image Courtesy of IUPUI University Library, Special Archives and Collections. He founded the Vonnegut Hardware Store in 1852, and was considered by the Indianapolis Star as “one of the city’s most respected citizens….” Like fellow Hoosier freethinker Hermann Lieber, he was a co-founder of the Socialer Turnverein and a forceful voice for public education. Clemens founded the German-English Independent School and served on its board for over 30 years. He also served as the first president of the Freethinker Society from 1870-1875, gave lectures to the society on occasion, and even translated the celebrated agnostic orator Robert Ingersoll’s Open Letter to the Clergy of Indianapolis into German for publication. His actions and beliefs heavily impacted the inception and growth of the Freethinker Society of Indianapolis. The German-English Independent School, also co-founded by Vonnegut. He would work on multiple school boards for over thirty years. Image courtesy of IUPUI University Library, Special Archives and Collections. True virtue is its own reward, which is not enhanced but rather misled by belief. Belief deprives us of the joys of this world by teaching us that we must detest them, and instead of them we must hope for a heaven. Belief forms the germ for persecution of those who differ from us in their religious convictions. 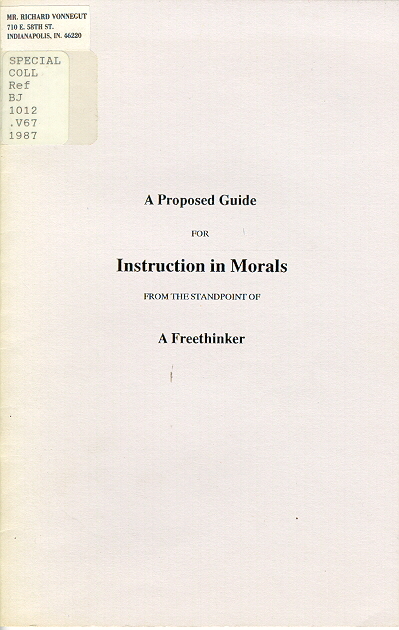 A Proposed Guide for Instruction of Morals, 1900. Published in both German and English, this pamplet by Clemens Vonnegut argued for a moral and just society without the need of superstition or religious beliefs. Courtesy of IUPUI University Library, Special Collections and Archives. Vonnegut saw morality as the wellspring of the “intrinsic quality of human character which ought to be nourished and cultivated early, continually, and carefully.” In subsequent pages, Vonnegut explained how such “cultivation” is achieved. Public education, family instruction, physical fitness, and social activities presented the means by which individuals perfected a moral life without the supernatural. Like Ingersoll, Vonnegut’s morality was clear, traditional, based in the family, and demonstrated a moral life without the need of God. While Clemens Vonnegut presented his philosophy clearly, the events surrounding his death were anything but. 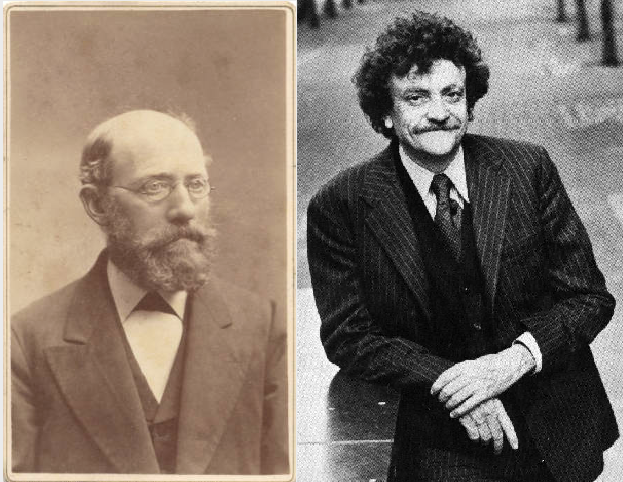 Clemens Vonnegut’s death in 1906 created somewhat of a mystery for his family, and later his great-grandson. It was said that he died in the snow . . . or so the story goes. Kurt Vonnegut recalls this story in his autobiographical work, Palm Sunday. In the winter of 1906, Clemens Vonnegut supposedly went for a routine stroll. Having lost his way, he wandered the streets of Indianapolis for hours before he was found dead by the side of the road by a search party. This story bewildered Kurt, whose own freethought can be traced to his great-grandfather and his own extended family. However, as with many family stories, this one stretches the truth a little. I do not believe in the atonement to the blood of Christ or in the sin of incredulity. I do not believe in a punishment in a future life. I believe neither in a personal God nor a personal devil, but I honor the ideal which man has created as the tenor of all virtues and perfections, and has named God. Until the very end, Clemens believed in the power of humanity to throw off the shackles of religion and embrace the values of inquiry and human-based ethics. Kurt Vonnegut, Jr. in New York City, 1979. Photo by Marty Reichenthal. Courtesy of slopemedia.org. Nearly a century later, famed author Kurt Vonnegut (born in 1922 in Indianapolis) wrote in Palm Sunday that his great-grandfather’s freethought was his own “ancestral religion” and that he was “pigheadedly proud” of the heretical nature of his family. 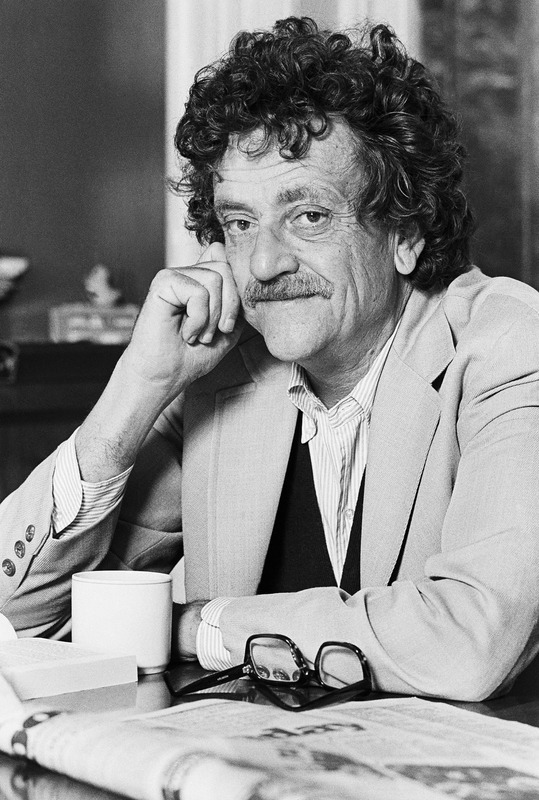 Kurt Vonnegut, a future honorary president of the American Humanist Association, carried the torch of freethought for his grandfather, and in some respects, introduced his ideas to a new generation. 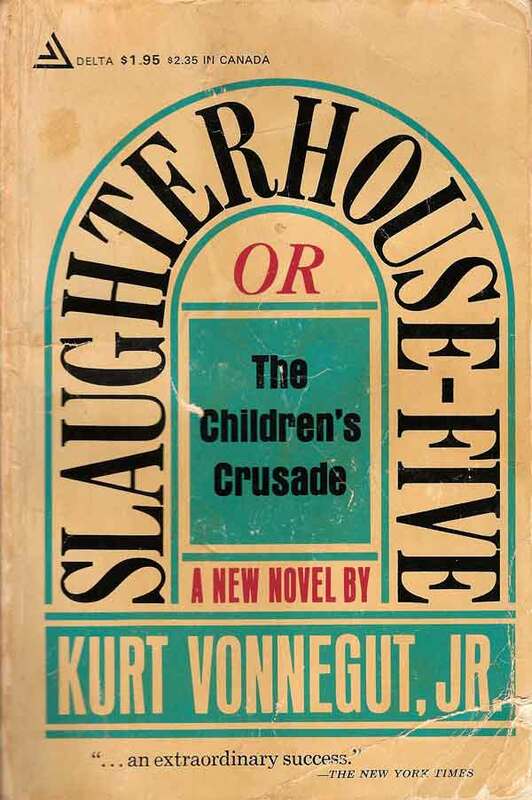 Slaughterhouse-Five (1969) would become Vonnegut’s most well known novel. Its open understanding of the barbarity of war, coupled with many humanist themes, continues to enthrall readers. Courtesy of In These Times. A military surgeon would have admired the clinical fidelity of the artist’s rendition of all Christ’s wounds—the spear wound, the thorn wounds, the holes that were made by the iron spikes. Billy’s Christ died horribly. He was pitiful. “So it goes” becomes the novel’s panacea; a way for the narrator to deal with the grim realities of war without the comfort of religious beliefs. In some respects, it can be seen as a mantra for humanism. 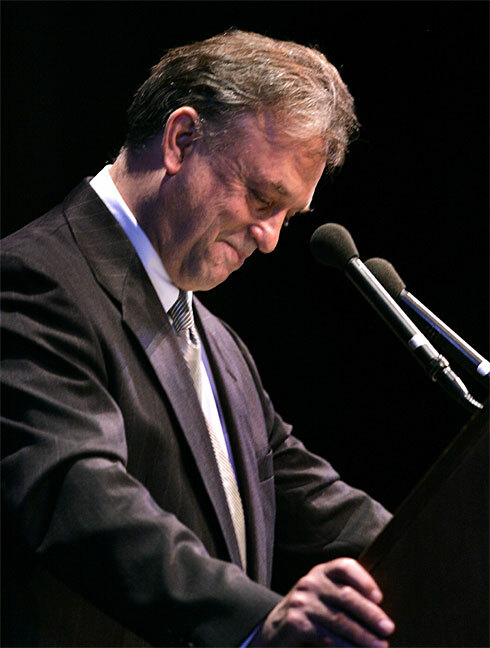 Kurt’s son Mark reading his late father’s remarks at Clowes Memorial Hall in April, 2007. This event capped Indianapolis’s “Year of Vonnegut” ceremonies. The author had died just weeks before he was to deliver this address. Courtesy of USA Today. Am I religious? I practice a disorganized religion. I belong to an unholy disorder. We call ourselves “Our Lady of Perpetual Consternation.” We are as celibate as fifty percent of the heterosexual Roman Catholic clergy. Actually—and when I hold up my right hand like this, it means I’m not kidding, that I give my Word of Honor that what I’m about to say is true. So actually, I am honorary President of the American Humanist Society, having succeeded the late, great science fiction writer Isaac Asimov in that utterly functionless capacity. We Humanists behave as well as we can, without any expectation of rewards or punishments in an Afterlife. We serve as best we can the only abstraction with which we have any real familiarity, which is our community. This emphasis on “community” squares nicely with Clemens’s own commitments to community, both with the Freethinker Society and with his advocacy of public education. Both Vonneguts believed that the values of sociality and comradery are essential to the flourishing of a community, and you can achieve that system without a supernatural element. Clemens Vonnegut’s humanism carried through many generations of his family and left an indelible mark on Kurt Vonnegut. The two men’s rejection of religion and the supernatural reinforced their love for humanity, their desire for community, and their commitment to the truth, no matter how horrifying it may be. Kurt’s own success as a writer and social critic would have delighted Clemens, who participated in many of the same literary pursuits and civic activities decades before Kurt was born. As such, their two lives, separated by time, nevertheless became entwined by their ideals. Their humanist legacy reinforces the diversity of intellectual and moral philosophies that embody the American Midwest throughout the 19th, 20th, and early-21st centuries. Both Vonneguts were proud to be from Indianapolis and the city proudly remembers them. [*] Kurt Vonnegut’s humanism may also be described as “Modern Humanism,” or “Naturalistic Humanism, Scientific Humanism, Ethical Humanism, and Democratic Humanism, [is] defined by one of its leading proponents, Corliss Lamont, as “a naturalistic philosophy that rejects all supernaturalism and relies primarily upon reason and science, democracy and human compassion.” Modern Humanism has a dual origin, both secular and religious, and these constitute its sub-categories” (Fred Edwords, “What is Humanism,” American Humanist Association, last updated 2008, accessed March 19, 2016, americanhumanist.org). Frederick Douglass, image courtesy of pbs.org. 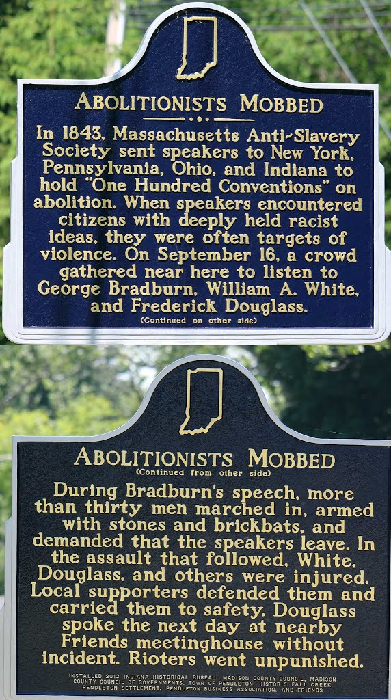 Whenever the great abolitionist leader Frederick Douglass and the State of Indiana are mentioned together, it is usually in reference to the mobbing of Douglass at Pendleton. Interestingly, were it not for a typographical error, a Westfield man would be included in the historic accounts as one of the defenders of Douglass. However, even aside from his brush with history, Micajah C. White and his connection to the anti-slavery movement make for an inspiring story. The story of Douglass’ assault is well known. In 1843, he was on a speaking tour of the midwestern states. He and several members of the New England Anti-Slavery Society were trying to rouse abolitionist support in what was then considered the Western U.S. Regrettably, they were met with hostility and threats. On September 16, they were to speak at a church meeting in Pendleton. As they tried to speak, a mob stormed the platform, tearing it down and attacking the speakers. Douglass attempted to defend himself and the others by grabbing a club and swinging it vigorously. However, a stone was thrown, breaking his hand, and another stone knocked him briefly unconscious. Eventually the mob relented, and the party retreated to a safe house. 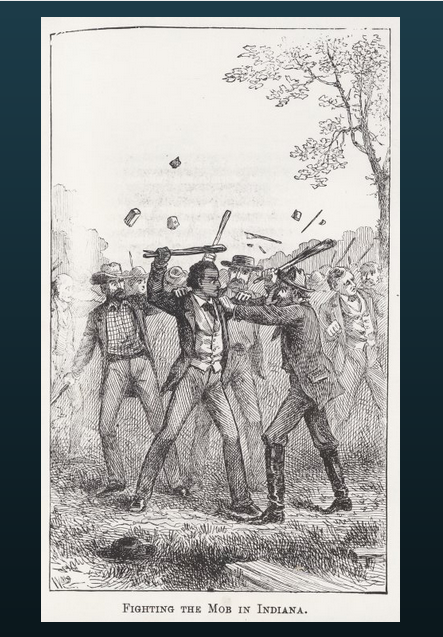 Douglass defending himself against mob, courtesy of the New York Public Library Digital Collections, accessed Kaily Kos. In Douglass’s autobiography, My Life and Times (1881), he used a curious sentence to describe what happened, saying, “They tore down the platform on which we stood, assaulted Mr. White and knocked out several of his teeth, dealt a heavy blow on William A. White, striking him on the back part of the head, badly cutting his scalp and felling him to the ground.” Most historians have assumed that it was William A. White of Massachusetts who received this terrible beating alone. However, it turns out that an overzealous editor simply trimmed someone out of the manuscript. Other sources supply the name. William A. White himself wrote a description of the event in the October 13, 1843 issue of the newspaper The Liberator. 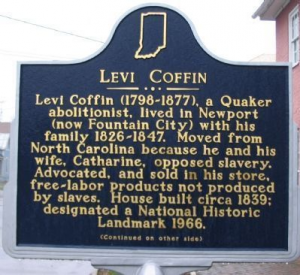 Indiana Quaker abolitionist Levi Coffin mentions it in his Reminiscences published in 1876. Frederick Douglass himself mentions it in an August, 1889 article for Cosmopolitan. After Douglass died in February of 1895, Thomas Lindley of Westfield and J. B. Lewis of Fall Creek Township wrote down their memories of the incident which were published in the local papers. Lindley’s father had been at the meeting and had gotten his hat knocked off. Lewis did not witness the assault, but he was able to see Douglass speak a few nights later at Jonesboro, Indiana. According to all of these people, the injured man was Micajah C. White of Westfield, Indiana. This would explain the odd sentence in the autobiography. Obviously, someone was confused by the two men named White. IHB historical marker, image courtesy of Panoramio. Unfortunately this confusion has obscured Micajah White’s involvement, a man who deserves to be mentioned with the early abolitionists. He was born in New Garden, North Carolina in 1819 to a family of staunch Quakers with strong abolitionist leanings. 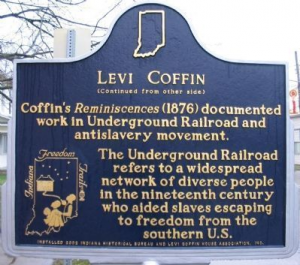 His father’s sister married Levi Coffin, the famous conductor on the Underground Railroad. The family moved from North Carolina to Milford, Indiana, in 1827, and from there to Hamilton County. 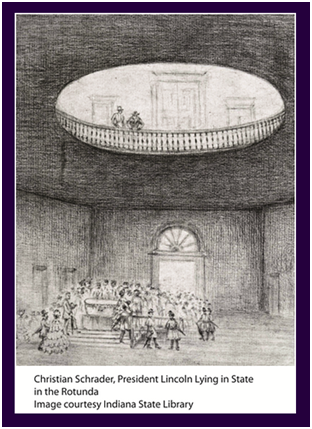 In 1833, the Whites were founding members of the Spiceland Quaker Meeting and in 1838, at the age of 19, Micajah was appointed recorder of Meeting Minutes. Sometime in the 1840’s, he married his first wife, Elizabeth. In 1845, his sister Martha began keeping a diary, which presents a clear picture of the family’s fortunes. Micajah, or “M.C.” as his family called him, joined the newly formed Anti-Slavery Meeting in Eagletown in 1845, two years after the assault. This was a group of dissident Quakers who felt they needed to take a proactive stance on the ending of slavery. These people were the ones most commonly involved in the local Underground Railroad. M.C. was disowned by the Spiceland Meeting for this action. It seems to be obvious that M.C. would be involved in the Underground Railroad. There is the standard problem that, because it was a secret organization, there is little written evidence of its activities. However, Levi Coffin reported in his Reminiscences that M.C. did assist him. IHB historical marker, image courtesy of Hmdb.org. The only local story that survives about M.C.’s activities in the UGRR involves a slave woman who reached Westfield just a step ahead of slave-hunters sometime around 1850. M.C.’s mother, Louisa White, owned an inn and the fugitive was placed in hiding there just as the slave-hunters happened to walk in and asked for food and lodging. Mrs. White calmly served them and then dressed the slave woman in some of her own clothes, including a large bonnet. The two of them coolly walked past the hunters and over to her son M.C.’s house, where the woman was helped on her way. Of course, there were other concerns in M.C.’s life. His daughter, Madeline, had been born in 1851. His second child, Eugene, was born in January of 1852. Tragically, his wife died in March and his son died in April of that year. He had to balance his own grief with the lives of the people he was assisting. M.C. was recognized as a key figure in the local anti-slavery movement. His mother’s brother, William Bundun, died in 1855. M.C. and Martha’s husband, Aaron Talbert, were witnesses of his will. After making bequeaths to his wife and children, Bundun said, “I direct also that the sum of 100 dollars when collected by placed in the hands of Micajah C. White or Aaron V. Talbert for the purpose of aiding or assisting destitute fugitive slaves on their way in making their escape from slavery to a land of Liberty – to Canada”. The Talbert and White families were very close. When M.C. 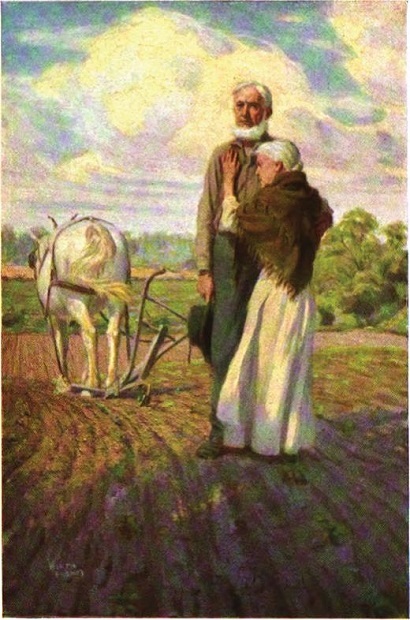 remarried in 1856, his new wife was Aaron’s sister, Patience. Because of their abolitionist sympathies, the Whites were probably more aware of national affairs than most people. The execution of John Brown on Dec. 2 1859, takes up two pages in Martha Talbert’s diary. It was particularly sad for her because it was the same date that her adored infant daughter had died seven years before. M.C. 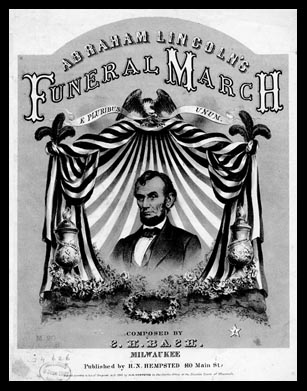 and Aaron Talbert went to the Republican National Convention in Chicago in May of 1860. It is unknown whether they attended as delegates or just spectators. This was, of course, the convention where Abraham Lincoln was nominated to the presidency. 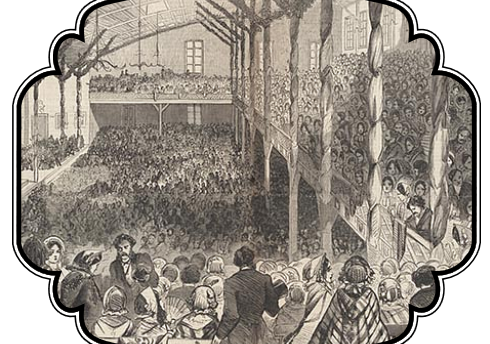 “The Republicans in Nominating Convention in Their Wigwam at Chicago, May 1860,” from Harper’s Weekly, May 19, 1860, accessed Library of Congress. While at the Convention, Underground Railroad activity continued at home and Martha Talbert possibly referenced escaped slaves in her diary. She refers to the people as “Kentucky refugees” and simply states that they are staying there. Any more detail probably would have been dangerous to write down. When the Civil War started in April of 1861, members of the White family left the Quaker church and joined the Army. M.C.’s brother Isaac joined the 12th Indiana Infantry, a one-year regiment. 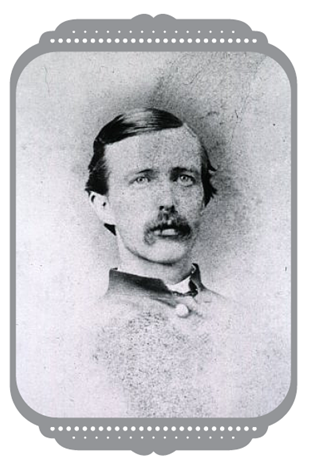 In 1862, he re-enlisted and joined the 101st Indiana and was appointed a Second Lieutenant. 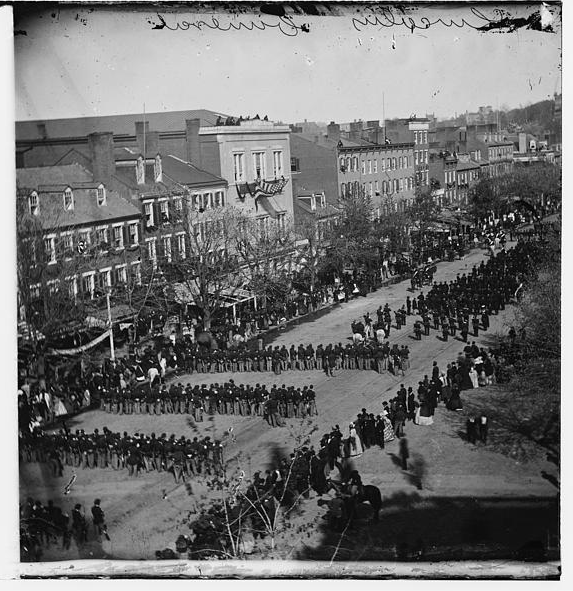 The regiment saw action in Kentucky and Tennessee and Isaac was later promoted to Captain. Another brother, Mordecai, became a recruiter for one of the new black regiments. He traveled to Vicksburg in 1864 to try to enlist ex-slaves. He finally enlisted himself in March of 1865 at about the same time Isaac was discharged for disability. M.C. 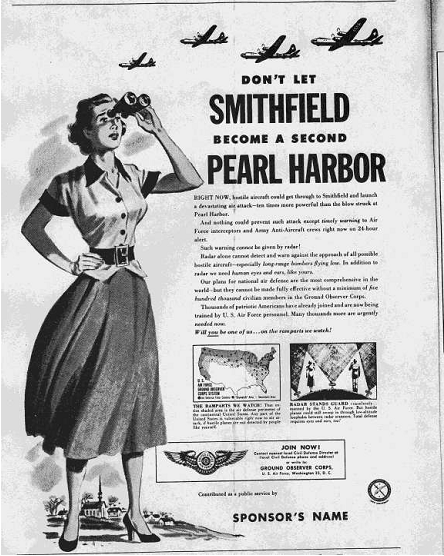 probably would have been more proactive at the beginning of the war, but was suffering from a series of lung ailments. 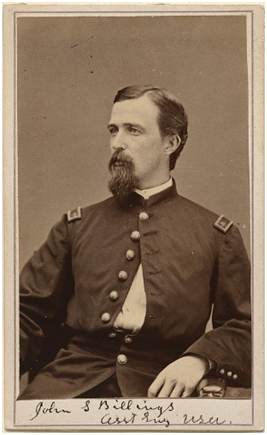 In 1862, he became the Military Agent for Washington Township. The job of the Military Agent was to assist the families of soldiers who may have been suffering while the breadwinner was away from home. 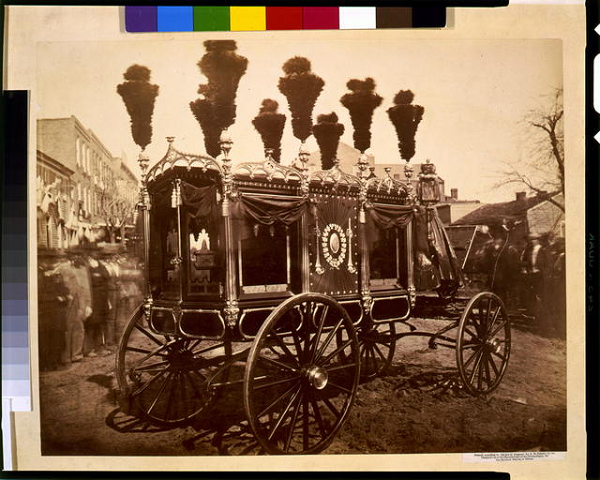 Then in October of 1863, M.C. decided to move his family to Minneapolis, Minnesota, probably for better economic opportunity. Whatever the reason, he was eventually joined by his sister Martha’s family, his mother, and the rest of his brothers and sisters. They prospered there and M.C. became a druggist. 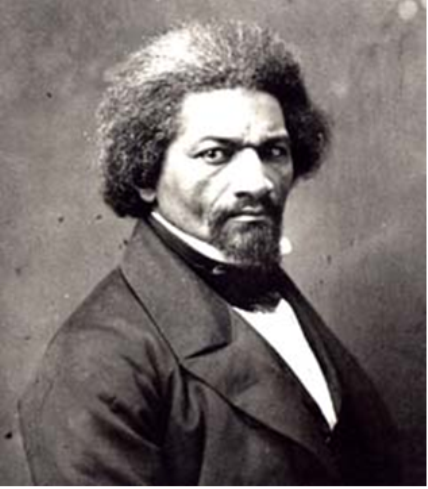 He died at the age of 70 on March 31, 1889, six years before Frederick Douglass. American naturalists have been cited for combining philosophy and writing in ways that affect how concerned citizens value and care for their environment. 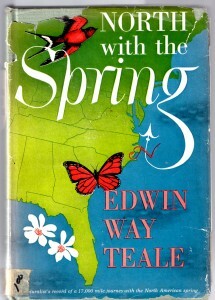 Edwin Way Teale is considered one of the twentieth century’s most influential naturalists, stemming from his ability to combine the artistic, philosophical, and scientific in his writing. According to the extensive Biographical Dictionary of American and Canadian Naturalists and Environmentalists, “Through his popular books [Teale] convinced Americans they had a personal stake in the preservation of ecological zones [and] convinced them to support national parks and conservation movements.” Teale credited his renowned career to his rich childhood spent in the Indiana Dunes, where he developed a love for nature, an eye for photography, and an accessible writing style. 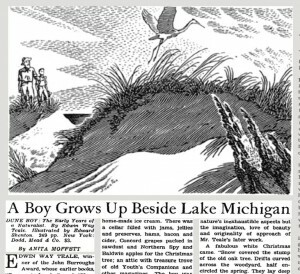 He immortalized his boyhood adventures in Dune Boy and later works, including Wandering through Winter, for which he became the first naturalist to win a Pulitzer Prize. Teale is included in the “heyday of dunes art and literature begun and perpetuated” by a group of artists of the “Chicago Renaissance” movement, according to J. Ronald Engel’s Sacred Sands: The Struggle for Community in the Indiana Dunes. Naturalists, conservationists, writers, and critics have ranked Teale among the renowned American naturalists, including John Muir, John Burroughs, and Henry David Thoreau. As he grew up, Teale’s interest in nature grew as well. At the age of seven or eight Teale looked through his first microscope, and at nine he declared himself a naturalist. By the age of ten he finished his twenty-five chapter “Tails [sic] of Lone Oak,” and at twelve he changed his name to “the more distinguished” Edwin Way Teale. 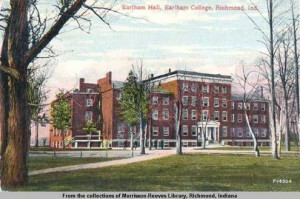 Earlham Hall, postcard, 1916, Morrison-Reeves Library, Digital Collection, accessed Indiana Memory. 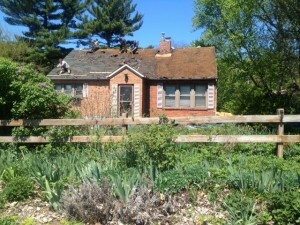 Teale Home (undergoing roof repair), photograph, 2013, Indiana Historical Bureau file. The Teales moved to New York City in 1924, where Edwin attended Columbia University, and continued writing. After a period of rejection, he obtained regular work assisting Frank Crane, a popular religious writer, with his daily editorial column. The Teales’ only child, David, was born in 1925. In 1926, Teale received his M.A. from Columbia in English literature. In July of that year, he also took possession of his grandparents’ property in the Indiana Dunes, where he and his family built a brick cottage. They maintained the property until selling it in 1937. 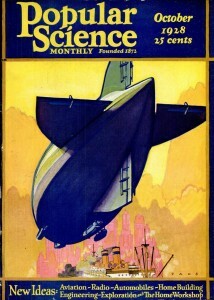 In 1928, Popular Science hired Teale as a staff writer. 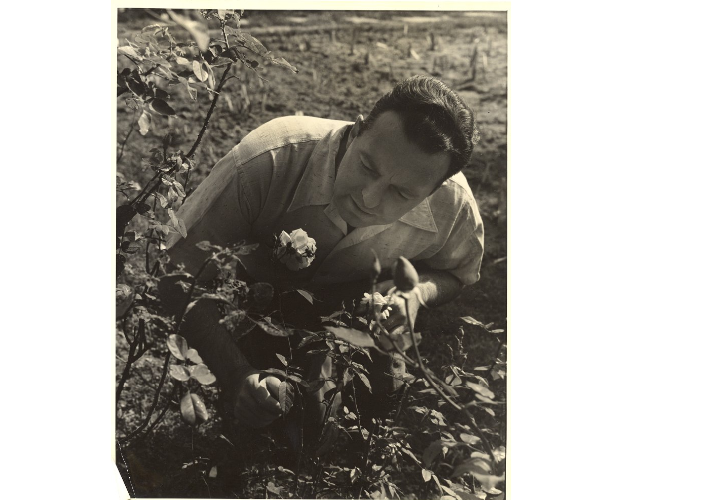 Over the next thirteen years, he perfected his photography skills at the magazine, which led his pioneering technique for photographing insects and launched his career. Teale used an icebox to immobilize his insect subjects, placed them in a natural surrounding, set up a camera with magnifying lens, and waited for the subject to reanimate. Using this technique, he represented insects in a novel way – up close and larger than life. After successfully exhibiting his photos around New York City, they were published in nature magazines. His first critically acclaimed book, Grassroot Jungles, displayed a collection of over one hundred of these photos. 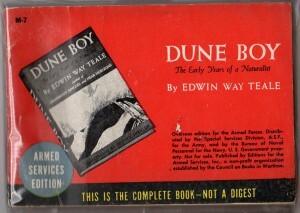 Indicative of the book’s popularity, the army distributed more than 100,000 copies of Dune Boy during World War II. These “armed service editions” were printed by the Council on Books in Wartime.” Their slogan was “books are weapons in the war on ideas.”Teale commented that “he heard from many who had read it while engaged in battle for freedom in all parts of the world” and some scholars have suggested that the book presents “a timeless model of the democratic common life, for many . . . an image of their real American homeland.” The Teales’ son, David, served as part of an assault team under General George Patton during the war. After a period of considering him missing in action, in March 1945 the Teales’ received word that their nineteen-year-old son had been killed. The Teales claimed that only their love of nature got them through this difficult time. Despite the personal tragedy, Teale’s career flourished. On November 19, 1945, The Lost Woods: Adventures of a Naturalist was published with critical acclaim and, beginning in January 1946, newspapers across the country began running Teale’s Nature in Action column. That November, Dodd, Mead & Company released a version of Henry David Thoreau’s Walden, “lovingly prepared” by Teale, who wrote an introduction and provided 142 of his own photographs. In November 1951, Dodd, Mead & Company released North with the Spring, the account of the Teales’ 17,000-mile, four month long pursuit of spring across America. According to one New York Times reviewer, the book was “packed with solid learning” about the plants, animals, and weather they encountered, but it was also a “warm and moving” story of husband and wife naturalists. Contemporary environmentalists, such as Rachel Carson, embraced North with the Spring‘s environmentally conscious message. Edwin Way Teale, “Skyscrapers, Scaup, Skimmers and Skunks,” New York Times, December 16, 1951, 189, accessed http://query.nytimes.com via subscription. 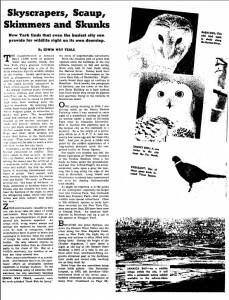 On December 16, 1951, Teale began writing for the New York Times, producing the first of many nature articles and book reviews. In his first article, Teale wrote of the efforts to protect the wildlife areas and lamented the increasing urbanization and encroaching suburbs. Teale also wrote about the importance of contact with nature “to restore mental tone and health,” a common concern among conservationists during this time period. 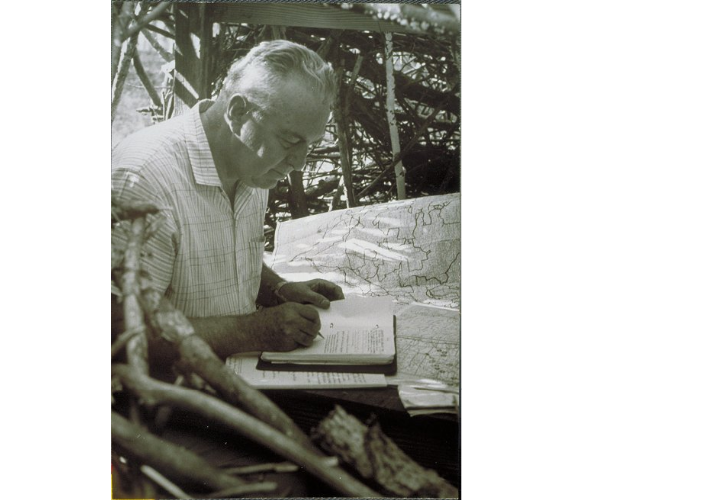 Over the next few years, Teale produced compilations of selected nature writing, including Green Treasury: A Journey through the World’s Great Nature Writing (1952) and The Wilderness World of John Muir (1954), which made the New York Times “outstanding books of the year” list. [Buy it at the IHB Book Shop.] 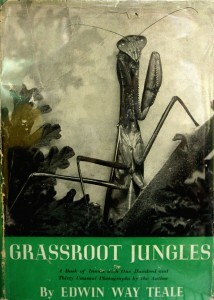 Reviewers called Teale “one of our most sensitive and observant naturalists” and among the “best of Americans writing about nature,” comparing him to Thoreau and Burroughs. Teale attended conservation fundraisers and entomological meetings. 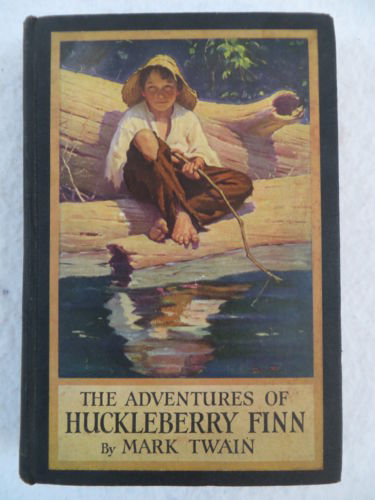 As his popularity grew, his earlier books were reprinted and adapted into children’s versions. 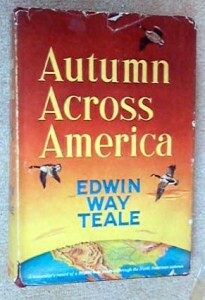 Edwin Way Teale, Autumn Across America (W. Clement Stone, 1956), cover image accessed amazon.com. In 1959, the Teales left their Long Island home, due to increased population and suburbanization, and moved to a 130-acre estate in Hampton, Connecticut, which they named Trail Wood. Edwin Way Teale, Wandering Through Winter (Dodd, ) cover image accessed Amazon.com. 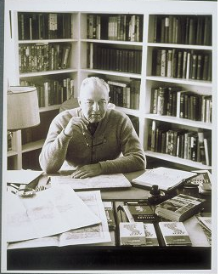 In fall 1965, Teale published Wandering through Winter, the most celebrated of all his works. Teale covered a wide range of topics from beetles to whales to sunsets. 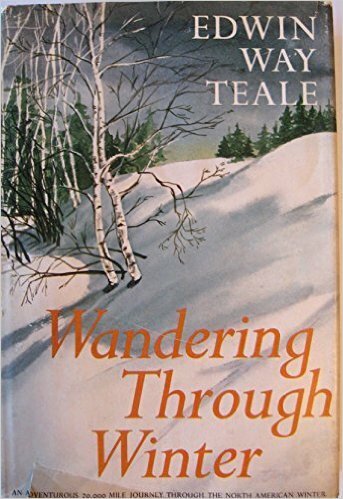 The New York Times ran a laudatory review of Wandering through Winter, praising Teale’s work as without fault and his writing as combining the best of Thoreau, Hudson, and Muir. In May 1966, Teale became the first naturalist to win a Pulitzer Prize (for general nonfiction) for Wandering through Winter. Although he continued to contribute introductions and chapters to colleagues’ books, and have his own books reprinted and adapted as children’s stories, his publishing slowed somewhat over the next decade. On October 10, 1970, Indiana University presented Teale with an honorary degree. In 1978, Teale produced his last work, A Walk through the Year. The book summarized a year with his wife Nellie at Trail Wood, highlighting the memorable experiences they shared. On October 18, 1980, Teale died at the age of 81. On May 17, 1981, the Connecticut Audubon Society dedicated Trail Wood as the Edwin Way Teale Memorial Sanctuary, and it became steward of the property. Nellie remained at the farm until her death in 1993. In 1998, the University of Connecticut initiated the Edwin Way Teale Lecture Series. 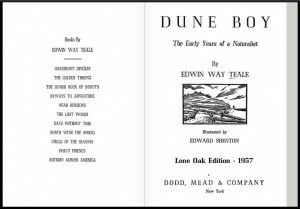 Visitors come to hike the grounds to see Teale’s landscape of “woods, open fields, swamps, two good-sized brooks and a waterfall.” Teale’s works continue to be reprinted, including a reissue of Dune Boy in 2002. 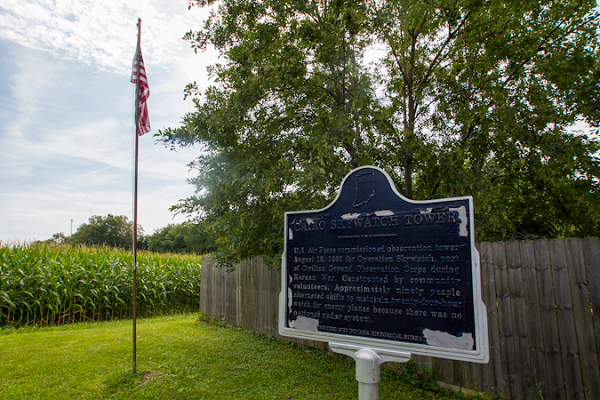 In 2009, the Indiana Historical Bureau, with the support of the Musette Lewry Trust, installed a state historical marker at the “Lone Oak” site where the brick cottage built by Teale still stands. The United States faces an abundance of national security concerns in 2016, ranging from North Korean nuclear testing to Islamic State nuclear ambitions. Russia was notably absent from the 2016 Nuclear Summit, which was “aimed at locking down fissile material worldwide that could be used for doomsday weapons,” while maintaining the largest stockpile of nuclear weapons in the world. These concerns prompt a question that originated in the early Cold War period: how can a nation prevent nuclear attack? The Ground Observer Corps, Advertising Material, A public service campaign prepared for the Department of the Air Force and the Federal Civil Defense Administration by The Advertising Council, Inc., Box 5, Folder “GOC- General 1953 (2),” 15A6, James M. Lambie Jr. Records, Eisenhower Presidential Library. When most think of early Cold War civil defense they recall bomb shelters and “duck and cover” drills. However, President Dwight D. Eisenhower implored Americans in a 1953 advertisement to “Wake Up! Sign Up! Look Up!” to Soviet airplanes potentially escorting an atomic bomb over the U.S. He encouraged them to do so through a collaborative program with the U.S. Air Force called the Ground Observer Corps, established in 1949. In the GOC, civilian volunteers were encouraged to build watchtowers in backyards and community centers, and to survey skies from existing commercial structures. 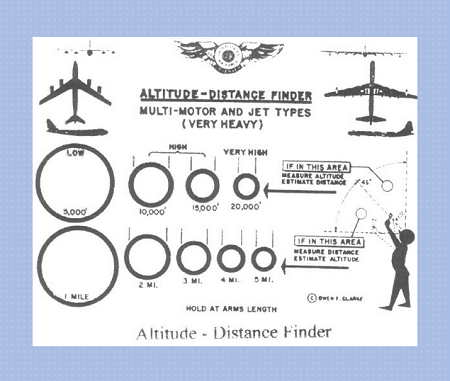 Utilizing a telephone, binoculars, observation manual, and log of duties, civilians searched the skies for airplanes flying lower than 6,000 feet, which could evade radar detection. At the sight of a suspicious, possibly nuclear-bomb-toting plane, civilians were to telephone their local filter center, staffed with Air Force personnel, who could then direct the plane to be intercepted or shot down. 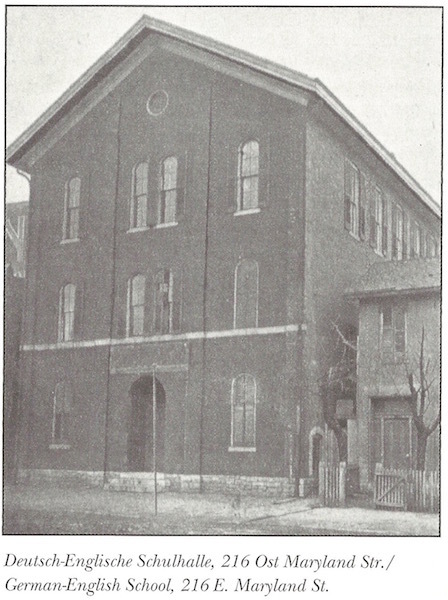 Image courtesy of Conneaut Valley Area Historical Society. This collaborative civil defense program involved approximately 350,000 observers, made up of families, prisoners and guards, the youth and elderly, the blind and handicapped, and naval and USAF personnel. 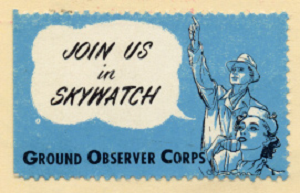 In 1952, the Ground Observer Corps operated 24-hours each day and became known as Operation Skywatch. Map, “One Call, the Ground Observer Corps,” U.S. Government Printing Office, 1954. According to articles and letters sent to Schricker in 1950 from other governors, GOC planning advanced more quickly and decidedly in Indiana than other participating states. Unsure as to how to proceed after a Washington planning conference, Illinois Governor and future presidential candidate Adlai Stevenson appealed to Schricker for advice. Schricker detailed Indiana’s planning process for Stevenson, stating that he would first contact every mayor, town board president and all “peace officers on every level throughout the state.” Days after the meeting, the Department of Civil Defense for Indiana compiled a list of observer posts for each county. On March 16, 1950, a mock air attack over Indiana illustrated the shortcomings of radar, as B-26 bombers flown by members of the Air National Guard of Indiana, Missouri and Illinois proceeded “completely undetected” by radar at Fort Harrison, the state’s only warning facility. Following the alarming mock air attack, municipal and county officials named Civil Defense Directors in 51 Indiana counties, who established observer posts in the northern two-thirds of Indiana. By late 1950, as the Korean conflict grew, the Air Force had partially constructed a filter center in South Bend, Indiana. Recruitment sticker, courtesy of Wikipedia. Diligent rural citizens, such as Larry O’Connor of Cairo, Indiana, organized movements to establish local GOC towers. O’Connor, a World War II Navy veteran and owner of Cairo’s only store (attached to his house), designated it the small community’s initial observation site. Cairo Ground Observer Corps tower, image courtesy of Queen City Discovery. In an interview with the author, Cairo resident James Haan shared that the post was necessary because Cairo was located along a line of beacon lights that could guide the enemy to industrial centers in Chicago. 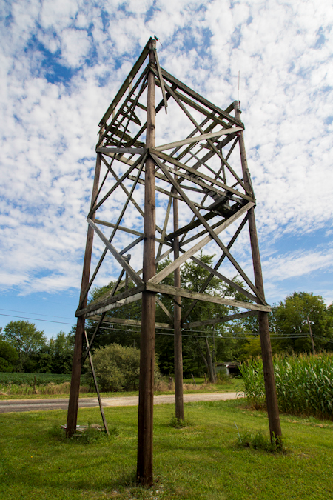 In 1952, building began on the Cairo observation tower and the local Rural Electric Membership Cooperative (REMC) donated and set the tower poles. Local merchants from Lafayette and the town of Battle Ground donated materials, and residents in surrounding areas furnished labor. Between 90 and 120 volunteers from surrounding areas volunteered at the Cairo tower. Haan states that volunteers worked in two-hour shifts and that he and other farmers worked all day in the fields, while female family members manned the towers, and the men volunteered throughout the night. 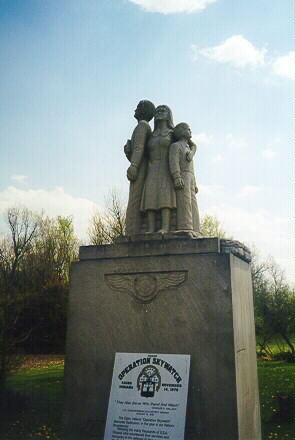 Commemorative limestone monument at Cairo watchtower, image courtesy of Tippecanoe County INGen Web Project. Under O’Connor’s direction, local residents held a dedication for the tower in 1976, commissioned a moment featuring limestone volunteers, and got the tower listed on the National Register of Historic Places. 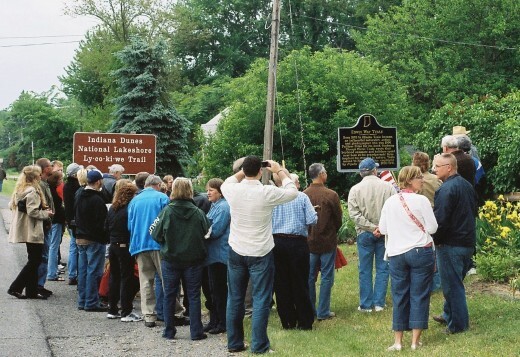 The site was later commemorated with a historical marker. 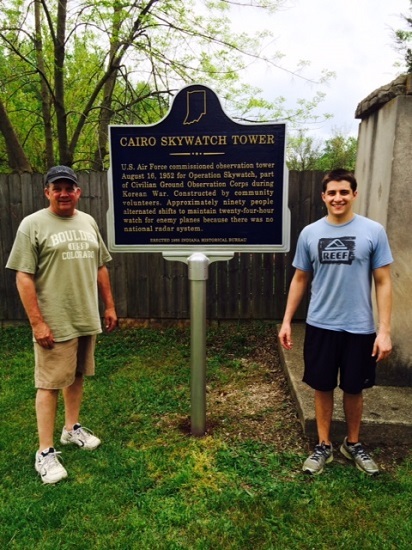 Site of Cairo skywatch tower and historical marker, image courtesy of Queen City Discovery. The GOC is now long forgotten, as demonstrated by the Cairo tower, once so revered by the community for decades, but now in decay. As with many civil defense programs of the 1950s, the GOC has been deemed a quirky, superfluous program, constructed by an overly-paranoid people. However, the GOC established a model of national defense that solicited the participation of the general public. It served as an opportunity for families, neighbors, and community members to spend quality time together through the shared objective of improving national security. As national attention returns to security concerns, the question remains: how does a country stop the detonation of a nuclear bomb? An NPR correspondent recently contacted the author about the potential for a piece about these Cold War watchtowers. Despite precarious national security issues, IHB is pleased to report that the Cairo marker has recently been repainted. 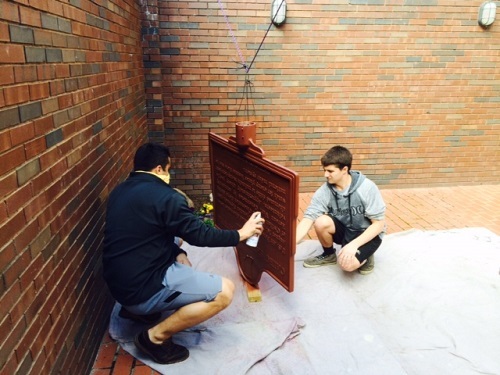 We are grateful to the Sigma Phi Epsilon Fraternity at Purdue University and Bruce Cole and his sons for their work to preserve the legacy of those vigilant Indiana citizens. Learn more about the GOC and Cairo tower with the author’s master’s thesis. Want more towers? Check out our blog posts about Hoosier surveyor Jasper Sherman Bilby, whose Bilby Tower was foundational to modern GPS. The period between the 1890’s and the 1920’s is known in the art world as the Golden Age of American Illustration. A surprising number of people from Hamilton County, Indiana, were contributors to this movement. Until recently, it wasn’t realized how interconnected they were. However, research has now uncovered material showing the extent of their influence on each other. 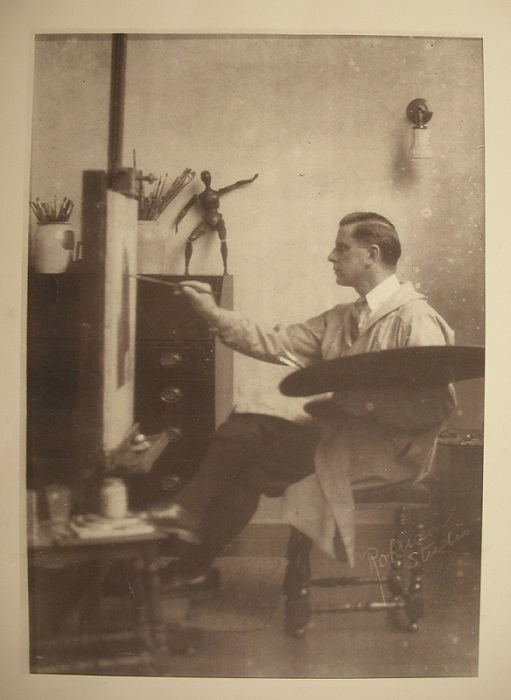 George Brehm at easel, courtesy of Hamilton East Public Library Collection. The patriarch of the group was Granville Bishop (1831-1902). Bishop was born in Fayette County and his family moved to Hamilton County in 1836. He was a self-taught artist who taught penmanship, painted wagons, and did advertising signs on buildings to supplement his income from painting. He did well enough to support a wife and five children despite being physically handicapped. Unfortunately, few examples of his work exist today. There are two paintings at the Indiana State Museum and a painting of the Indian chief Red Cloud somewhere in the Indianapolis area. According to an interview with George Brehm in the May 1943 issue of the Rainbow, the national magazine for the Delta Tau Delta fraternity, Bishop and an unknown woman watercolorist were credited as the inspirations for some of the next generation of Hamilton County illustrators. 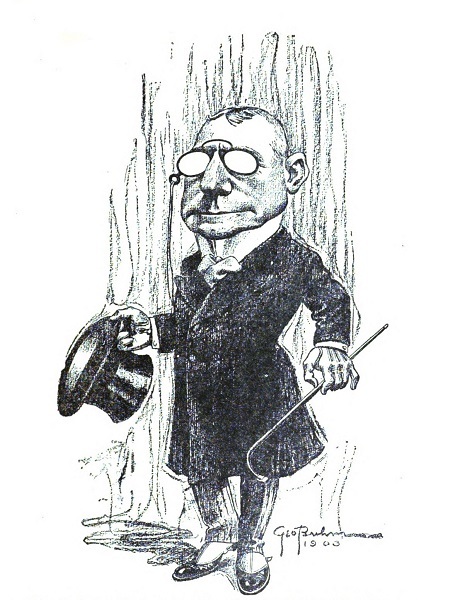 James Whitcomb Riley, illustrated by George Brehm, Bookman magazine (December 1903): 349, accessed Hathitrust.org. George Brehm (1878-1966) and James Ellsworth “Worth” Brehm (1883-1928) were key members of the group. After graduating from Noblesville High School in 1898 and 1902 respectively, they went to Indiana University and other schools for training in art. George achieved his first local fame by doing caricatures of Hoosier authors. After working at the Indianapolis Star, they moved to New York around 1905 and were soon very successful. George had his first Saturday Evening Post cover in 1906 and Worth had his first cover in 1908. They established separate careers in 1912 when Worth moved to an artist colony in Connecticut. George and his family had an apartment in New York and a summer home on Martha’s Vineyard. Much of the brothers’ work was based on scenes from their boyhood in Noblesville. James Ellsworth Brehm, “The Song of the Cardinal,” Retail Catalog of Standard and Holiday Books (1913-1914): 76, accessed Google Books. Franklin Booth (1874-1948) and Hanson Booth (1884-1944) were raised in Carmel and followed much the same path as the Brehms. Hanson went to Noblesville High School and was a classmate of Worth Brehm. Franklin Booth would return to Carmel from New York on regular occasions and eventually built a studio behind his family’s home. He is the only one of the four artists who is buried in Hamilton County. He developed a very unique style based on hundreds of pen strokes that would make the finished drawing look like an engraving. Three books have been written about Franklin and his style which, among other things, has become an important influence on modern comic book artists. 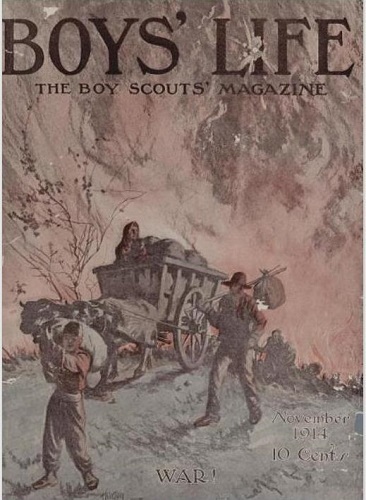 Hanson Booth, Boys’ Life (November 1914), accessed Google Books. These four artists did illustrations for books, advertisements, and stories in magazines such as Ladies Home Journal, American Magazine, Colliers, and Cosmopolitan. For a short time, they ran an art school together. Their work could also be found in the business magazines of the period. At one point or another, all of them worked with James Whitcomb Riley. George Brehm did work as varied as Saturday Evening Post covers, women’s magazines, Business Week, and Edgar Rice Burroughs stories. Worth Brehm was known for his illustrations of children, and became famous for his images of Penrod, Tom Sawyer, Huckleberry Finn, and others. Franklin Booth did pipe organ advertisements and worked with authors like Theodore Dreiser and Joyce Kilmer. Hanson did not become as well-known as his brother, but did work for pulp adventure magazines, Popular Science, and Boys’ Life. Circa 1923, image courtesy of Terapeak. Thomas Blaine Stanley (1884-1965), a classmate of Worth Brehm and Hanson Booth at Noblesville High School, became known for a different kind of drawing. He began as an illustrator, but eventually got a degree in English. He used his degree to teach courses in business English, which eventually developed into the modern profession of Marketing. 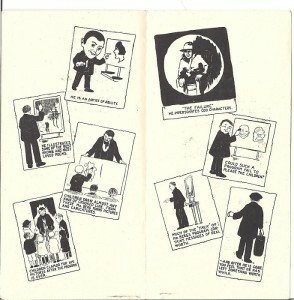 He wrote two standard textbooks on the subject, which would have been used by the sort of people who populated the fictional HBO series “Mad Men.” Along with this, he used his art skills to become a cartoonist, creating a regular business-oriented comic strip in the magazine Advertising and Selling. It could be considered a “Dilbert” for the 1920’s. 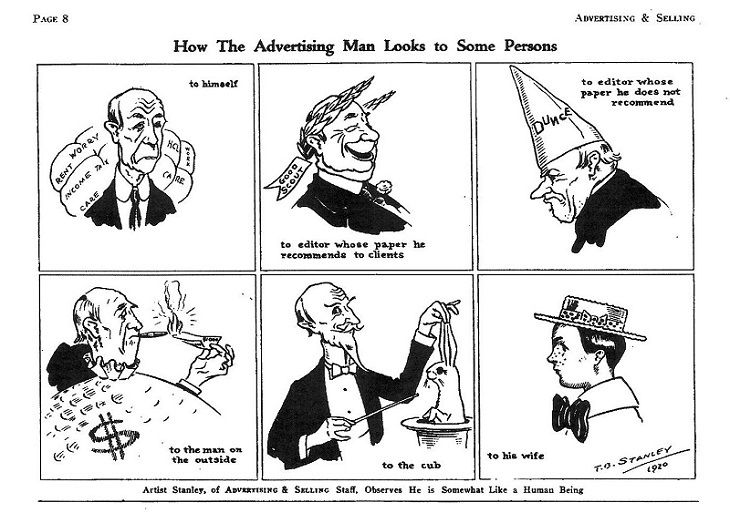 Thomas Stanley, Advertising and Selling (June 26, 1920), accessed Google Books. Franklin Booth had protégés – Ralph Applegate (1904-1978) and Booth’s nephew Grant Christian (1911-1989). Applegate was known for creating murals at the 1933 Century of Progress Exposition in Chicago. Christian was a part of the WPA post office mural project and did murals in Indianapolis and Nappanee. There were also acquaintances of the group who were recognized locally for their art talent, but went into other careers. Worthington Hagerman (1878-1967) worked for the State Department and was Consul in Lisbon, Portugal, during WWII. Buren Mitchell (1886-1955) became a respected college theater teacher in Oregon. 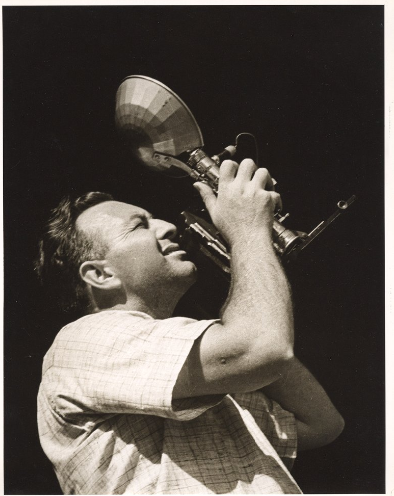 Russell Berg, accessed Stanton Renner Collection. There were other area illustrators, but it’s not known how much they interacted with the group. Russell Berg (1901-1966), did illustration and editorial cartoons, and became known for his Chautauqua performances involving drawing and lecturing. Floyd Hopper (1909-1984) was known regionally for his watercolors, and known locally for his illustration and mural work. While Hamilton County is not typically thought of as having an artistic heritage, obviously there was inspiration here. The tradition is evident in the ever-developing Carmel Arts and Design District, which features various galleries, showrooms, and the Hoosier Salon. Continuing to research and discuss artists of the past will highlight Indiana’s artistic heritage and, hopefully, encourage others to follow. Learn more about the state’s rich artistic history with IHB’s state historical markers: William Merritt Chase, William Forsyth, and T.C. Steele.